Keyword Review is an analysis I will write about where a keyword phrase has been identified as “surging” over a certain length of time. 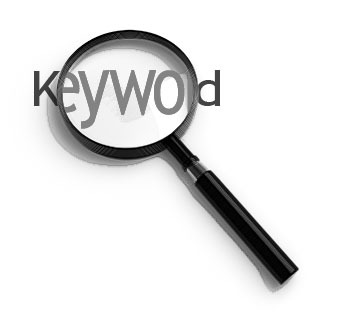 I prefer to review keyword phrases that have been growing over at least a 3 – 6 month period. This would typically indicate a much deeper movement in a particular keyword market. 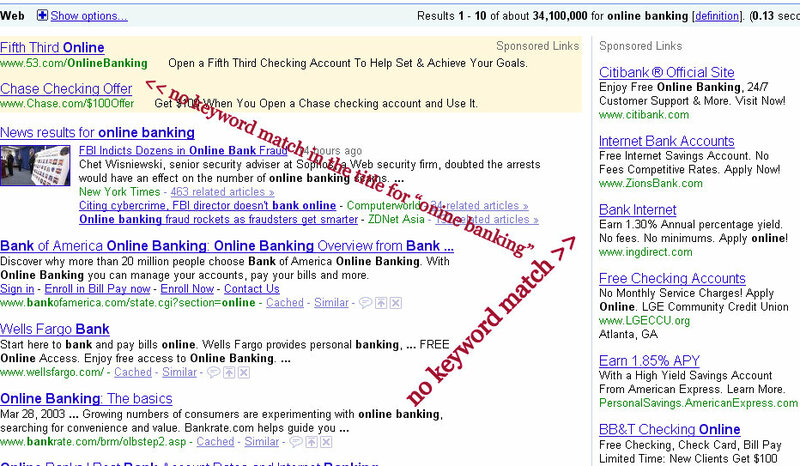 Let’s look at the keyword phrase “online banking” (search [online banking]). 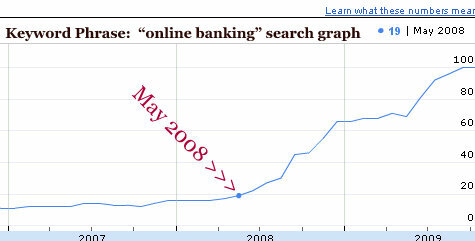 Searching volume for “online banking” started to increase at the beginning of May, 2008. The incline was gradual throughout that summer. 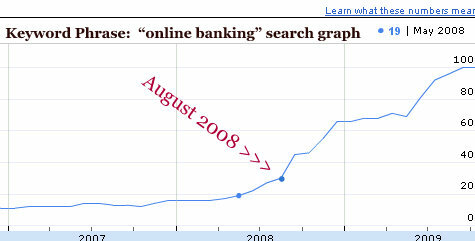 However, in August of 2008, the volume of searches for “online banking” took a dramatic change. Since August of 2008 to August 2009, the level of search volume of “online banking” has increased by a factor of 4. This search volume has mostly originated in the southeastern United States – primarily within the metro areas of Tampa, Orlando, Charlotte, Atlanta, and Miami. And as you can see, 3 of these top 5 metro areas are within the state of Florida. One can only speculate as to the exact reason why the keyword phrase “online banking” has grown so much in popularity. However, my guess is that due to the rise in mobile phone accessibility, and mobile phone applications, the access to online banking has become unprecedented. For example, Bank of America has an iPhone App that allows you to quickly, and easily view the details on your banking account. This iPhone App is free, and only takes a couple of second to install, launch, and then login, and the details of your account are 100% accessible. Read the details of Bank of America’s iPhone App. What are your thoughts on the dramatic rise in volume for the keyword phrase “online banking”? When you search phrase in Google, and don’t see that phrase in blue bold letters in the title of the sponsored ads, that means these advertisers are not targeting that specific phrase. In my view, there is a wide open opportunity for someone, or some company, to quickly capitalize on the keyword pharse (exact match variation) [online banking]. From the looks on the front page of Google for that search (see image above), there are no advertisers targeting that phrase. Again, let me know your thoughts about this keyword review. Also let me know if you have a keyword phrase that you’d like me to analyze on your behalf – it would be my pleasure to do so!